the sunflower played a great role in their sports activities . . . eating sunflower seeds! and at the soccer fields too! with the bright and beautiful golden yellow of the sunflower petals. I added some roses and double blooming kalanchoe. In the Berry Patch house there is a very large sunroom . . . approximately 12′ x 30′ in size. using my tea cart that was previously on my upper back porch. I had a pair of frameless canvas prints in the former bath across from my hubby’s office. 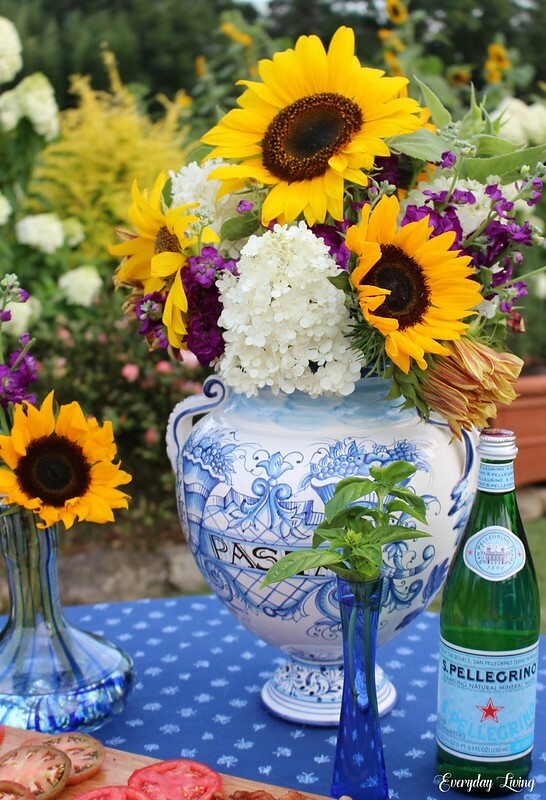 and also works very well as a backdrop for the sunflower arrangement. along with some greenery for added texture. 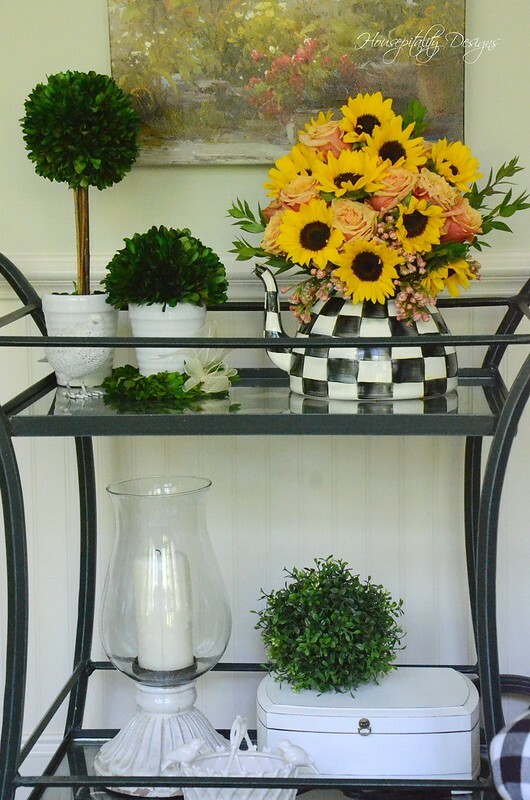 and began creating a casual vignette for the sunflower arrangement. Sunflower seeds are a powerhouse of vitamins, minerals, and other important nutrients. Sunflower seeds are rich in magnesium, potassium, selenium, zinc, and iron. The seeds improve digestion, brain power, and the functioning of the cardiovascular system. I think I need to be eating more sunflower seeds! as you can cook nearly any recipe with this oil. light taste, and associated health benefits. Sunflower oil has more vitamin E than any other vegetable oil available in the market. as it has low saturated fat levels. and keep the food fresh and healthy for a much longer time. 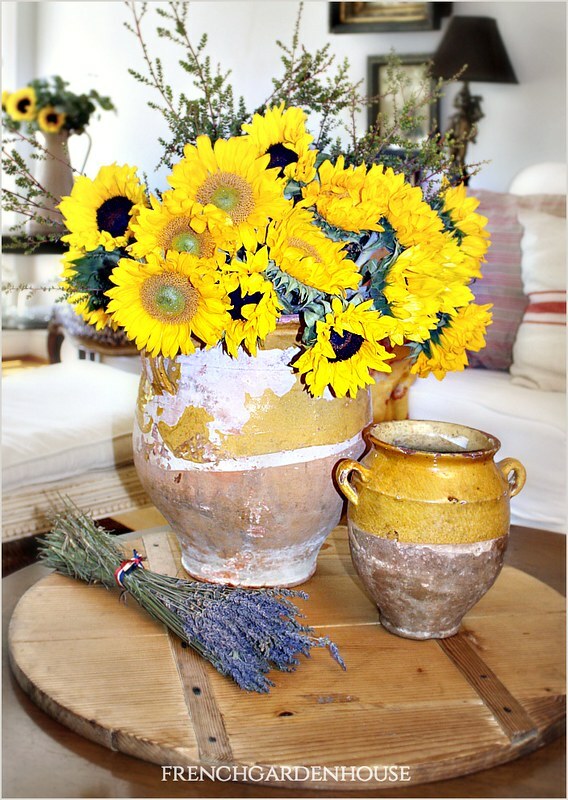 So, not only is the sunflower very beautiful, it’s health benefits are also a beautiful thing! 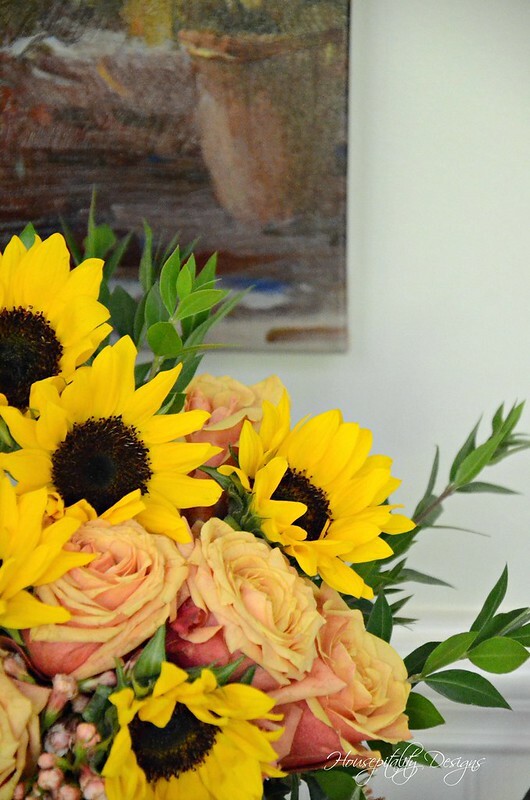 Hope you enjoyed this sunflower arrangement that have I created with my mom looking on. from these lovely and talented ladies! The links to their posts are below their image. Aren’t these sneak peek images beautiful? I wish you all a most wonderful and beautiful day and weekend! 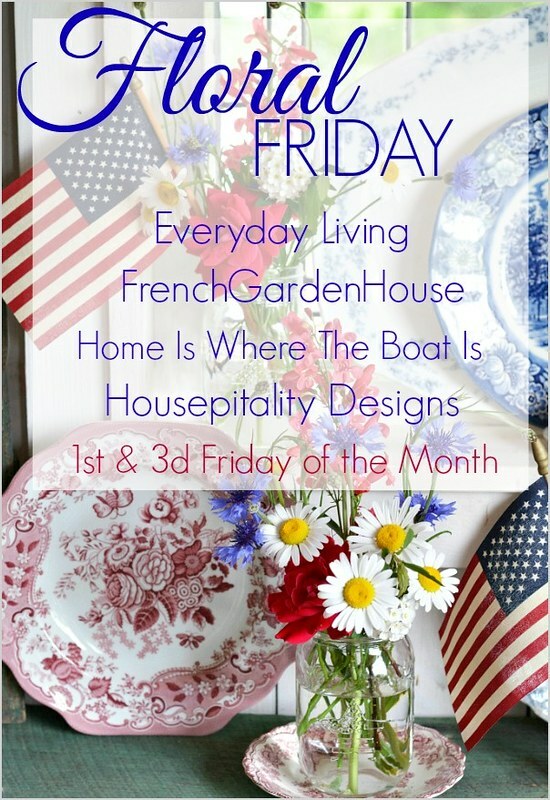 Thank you for visiting Floral Friday! not to worry, there is still time to enter. Just click on the highlighted link above. I have teakettle envy Shirley!! 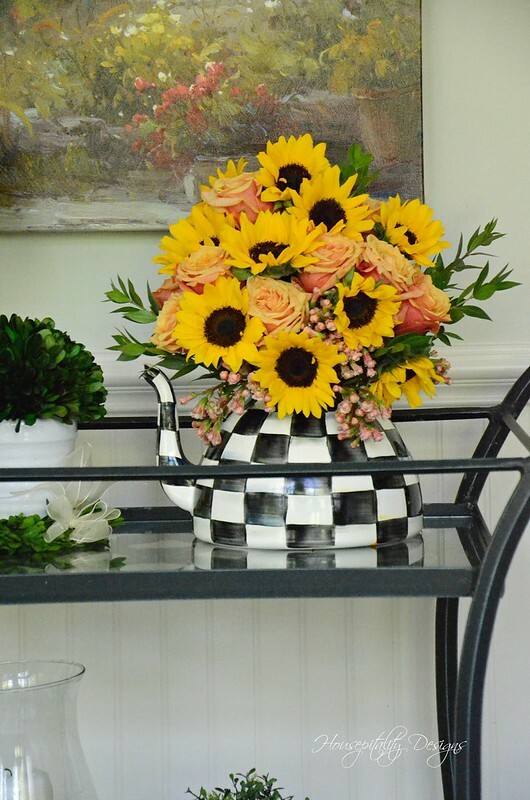 Your Courtly Check teakettle is just beautiful as a vessel for serving up those gorgeous sunflowers! 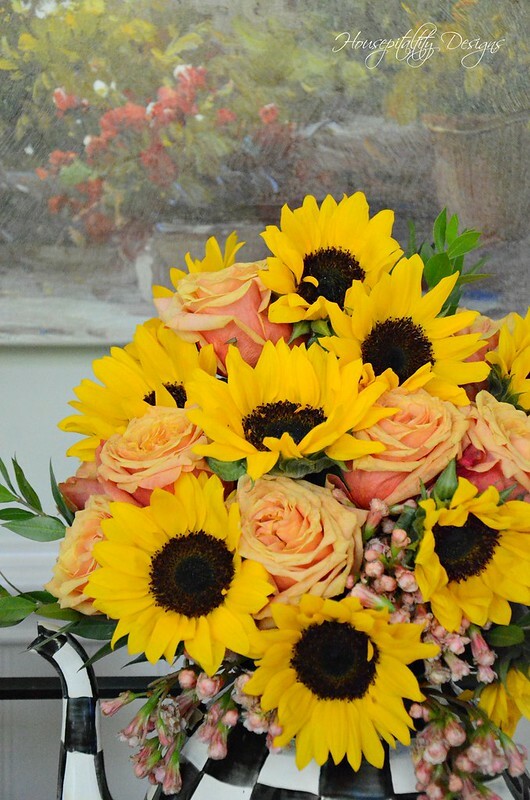 I love them paired with your yellow and coral roses and double bloom kalanchoe. 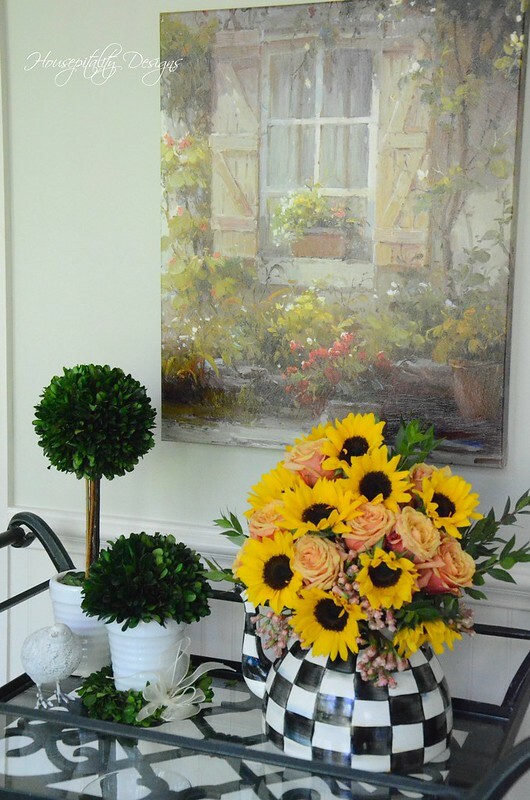 Such a pretty vignette you were able to put together on your tea cart with the canvas prints as a backdrop in the midst of your unpacking and travelling. I hope you’ve been able to relax some and a have wonderful visit with your mom. Thanks so much for the beautiful start to my day. It’s always a pleasure to join you for Floral Friday! Shirley, I love your floral arrangement in your MC kettle. Adding the coral roses and kalanchoe was brilliant. They add a spark that drew me in immediately. Thank you for all the facts about sunflower seeds and oils. I need to eat more with all those benefits. I am amazed how you manage to research and even have energy to buy flowers much less arrange them and do a blog post after all the moving and unpacking. Beautiful! I love the roses with the sunflowers. 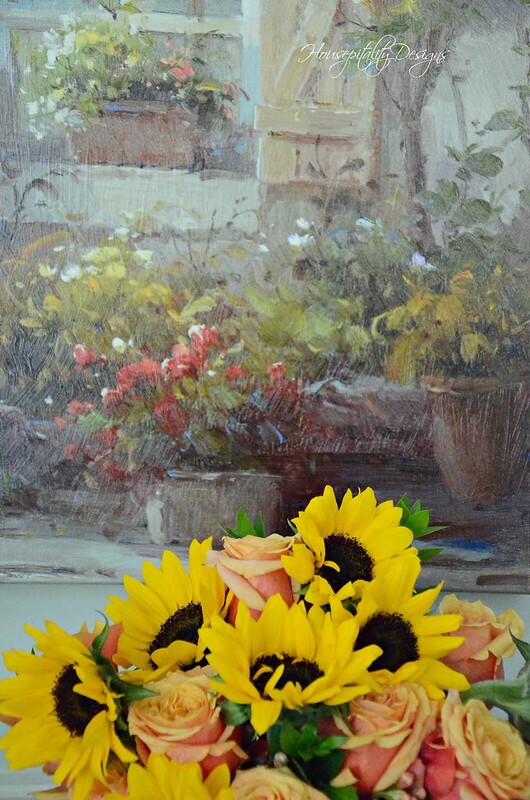 I feel like I am part of this group this week, because my last post from a few days ago features sunflowers!! 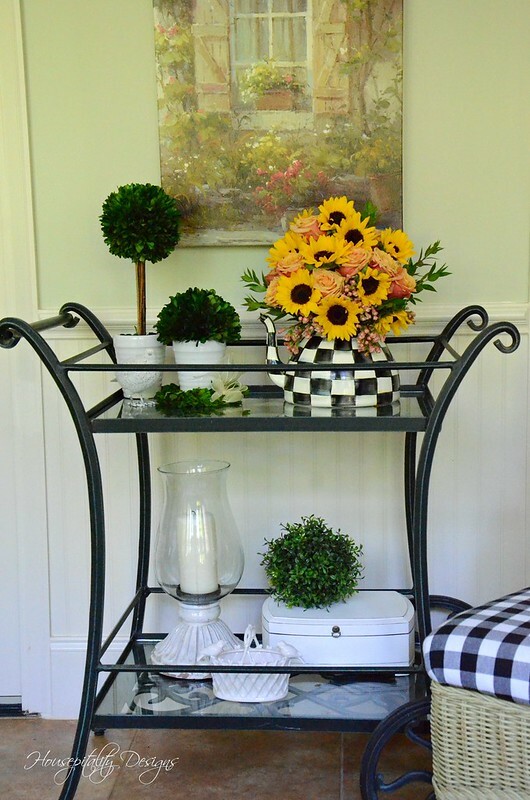 I love the sunflowers in the Mackenzie Child’s resettle. Perfect vessel for the display. Who knew sunflowers were so healthy! Have a great weekend. From your photos one would never know you are in the midst of moving disaray. Shirley, this arrangement is pretty and is a showstopper. The combination of flowers is perfect. The canvases you chose are a super backdrop. I’m going to start eating more sunflower seeds, big fan. When watching baseball I learned they make different flavors but I think I may be old school. Love the teakettle. sunflowers always remind me of my grandmothers grden. Shirley, how beautiful the flowers look against that charming McKenzie Childs teakettle with the courtly check! 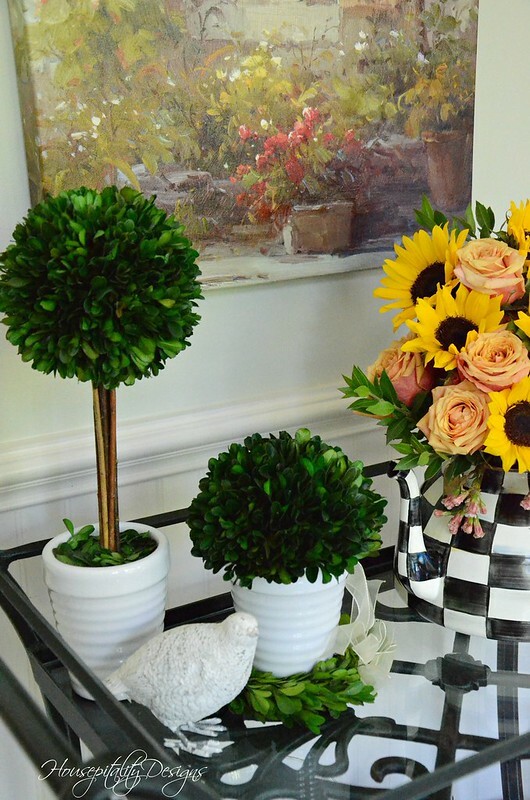 I agree with Cindy, this arrangement is a showstopper, the colors and the different sizes and shapes of the other flowers are the perfect combination – so cheerful! 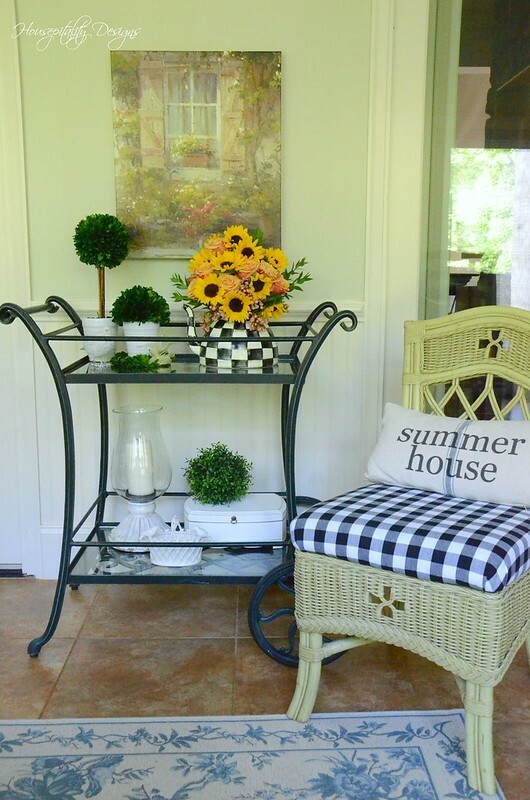 You created such a welcoming display on your tea cart with the canvas prints as a backdrop. I am sure it cheers you in the midst of your unpacking and settling into the new house. Thanks so much for the beautiful start to my day, it is such a blessing to join you for Floral Friday! Beautiful, indeed, Shirley, and packed with lots of good, fun facts. I couldn’t believe the picture I saw when I opened this. My first thought was it was an archive photo, but NO! Ms. Shirley already has vignettes ready for blogging in the midst of probably the biggest move of your life! Oh my, you amaze me. 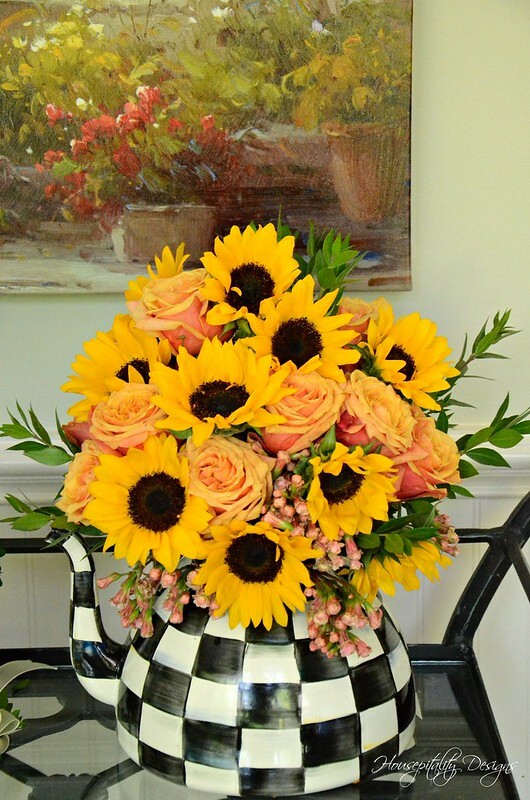 The arrangement is gorgeous, the Courtly Chcek kettle pairs perfectly with sunflowers. Here’s hoping your unpacking and sorting continues to inspire. 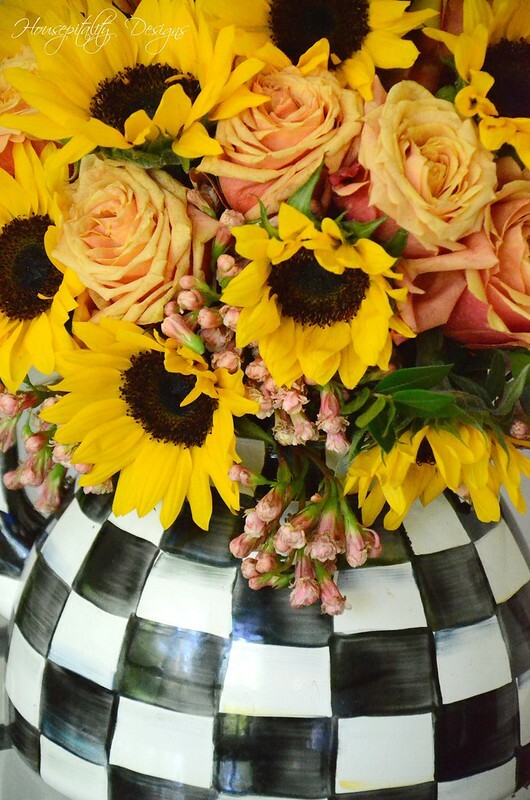 Love the sunflowers in the black and white kettle. Just perfect and have a great weekend! This post has put a smile on my face after a big downer of a day, so thank you. I love the arrangement and the tea kettle is a beautiful “vase”. Love the whole vignette. Have a great weekend and enjoy every moment with your dear Mom. Beautiful! A feast for the eyes! Your ability to weave beauty with a story is always delightful! 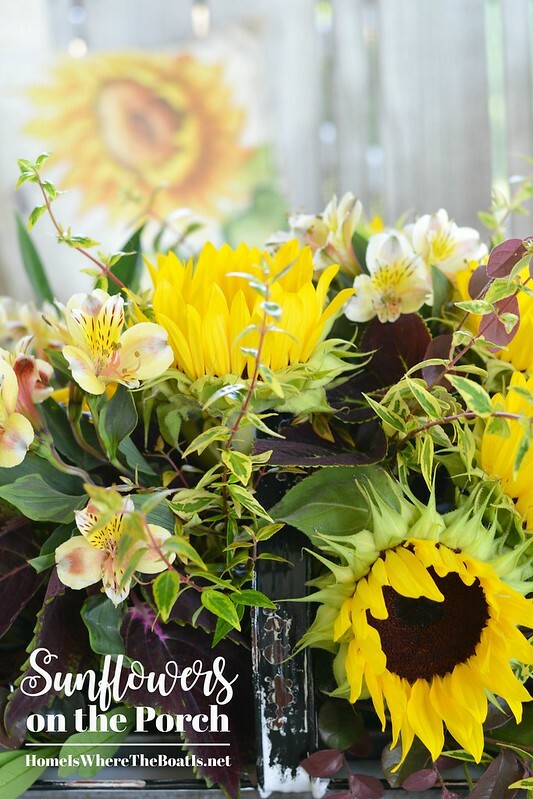 Shirley, a lovely arrangement and great information regarding sunflowers. Hope this finds you getting settled in your new, but temporary, home and enjoying time with your Mom.